This summer, the Jezreel Valley Regional Project1 teamed up with Israeli archaeologist Yotam Tepper to expose a Roman camp just south of Tel Megiddo known as Legio. In this web-exclusive report, directors Matthew J. Adams, Jonathan David and Yotam Tepper describe the first archaeological investigation of a second-century C.E. Roman camp in the Eastern Roman Empire. 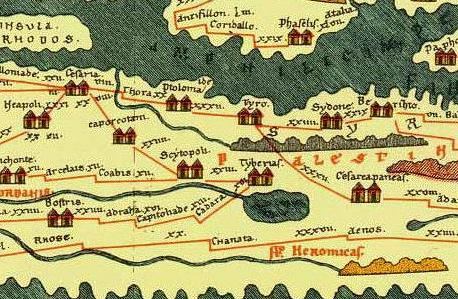 Based in the Jezreel Valley somewhere near Tel Megiddo, the Legio VI Ferrata, or the Sixth Ironclad Legion, was well situated to control imperial roads, with direct access to the Galilee and inland valleys of northern Palestine—important centers of the local, occasionally uproarious, Jewish population. Until recently, the exact location of the castra (“camp” in the sense of a permanent military base) of the Sixth Legion had not been confirmed, but textual evidence places it in the Jezreel Valley along the road from Caesarea to Beth Shean in the vicinity of Megiddo (see the Peutinger Map, right). In the Ottoman Period, the village and caravanserai of el-Lajjun preserved the Latin nickname “Legio,” providing strong evidence for the location of the castra nearby. Consequently, the broad area south of Tel Megiddo has been known in modern archaeological circles as “Legio.” Historical sources of the Roman and Byzantine eras indicate that three different settlements existed in this vicinity: the Jewish village of Kefar ‘Othnay (Caparcotna), a Roman military camp (Legio) and a later Byzantine polisof the 4th and 5th centuries C.E. (Maximianopolis). After Gottlieb Schumacher’s early 20th century work around Megiddo, the most intensive survey of this area was conducted by Yotam Tepper, who attempted to clarify the exact location of the castra, the village and the polis. As part of his Ph.D. research at Tel Aviv University, Tepper delineated discrete areas of Roman material culture remains, including coins and roof tiles stamped with the name of the Sixth Legion, concentrated in and around a large agricultural field known as el-Manach2. Additionally, aerial photographs, satellite imagery and LiDAR (topographical laser scanning) data hinted at a large rectangular structure, approximately 900 feet by 900 feet, just beneath the surface surrounded by depressions. While working nearby on behalf of the Israel Antiquities Authority in 2003–2005, Tepper also uncovered the famous 3rd-century Christian prayer hall at Megiddo Prison, the mosaics of which bore dedicatory inscriptions to “God Jesus Christ,” including one sponsored by a centurion named Gaianus.3 Overall, Tepper concluded that there was compelling evidence pointing to the exact location of the Sixth Legion’s headquarters in the agricultural field of el-Manach. An aerial view of the test trenches, facing south. Photo: JVRP. Legio did not disappoint. Over the course of only ten full excavation days, with the assistance of American and European students working side-by-side with members of local youth and community service groups, the team dug test trenches (see photograph above) measuring approximately 295 feet by 16.5 feet that revealed clear evidence of the camp. At the north end of this line, we found that the depressions evident in aerial photography were in fact part of a Roman camp’s typical defensive trenching earthworks, the fosse. Next to this 6.5-foot-deep ditch was the foundation of a great wall nearly 20 feet wide, evidently the main circumvallation rampart of the camp. Inside of that wall in the remaining 230 feet of our test trenches, the team exposed rooms likely belonging to one of the barracks areas of the camp. Much of the architectural remains had long been stripped away, but within the rooms were numerous ceramic roof tiles with the legion’s mark (below), coins, fragments of scale armor, lead ingots and a stone table leg sculpted with the three-dimensional visage of a panther. A Reflectance Transformation Imaging (RTI) scan (center) brings out the details of a tile marked with the legion's insignia (right; traditional hand drawing at left). Courtesy JVRP. Near the southern extent of our excavation, the putative barracks were bounded by a wide street carved in bedrock and flanked by drainage channels. Crossing the camp at about one-third of the length of the north-south walls, as estimated via aerial photography, this important street was probably the camp’sVia Principalis, “Main Street,” a typical feature of such castra. Considering the regular structure of Roman camps, the Porta Principalis Dextra, the main eastern gate of the camp, should lie just outside of our excavation area. 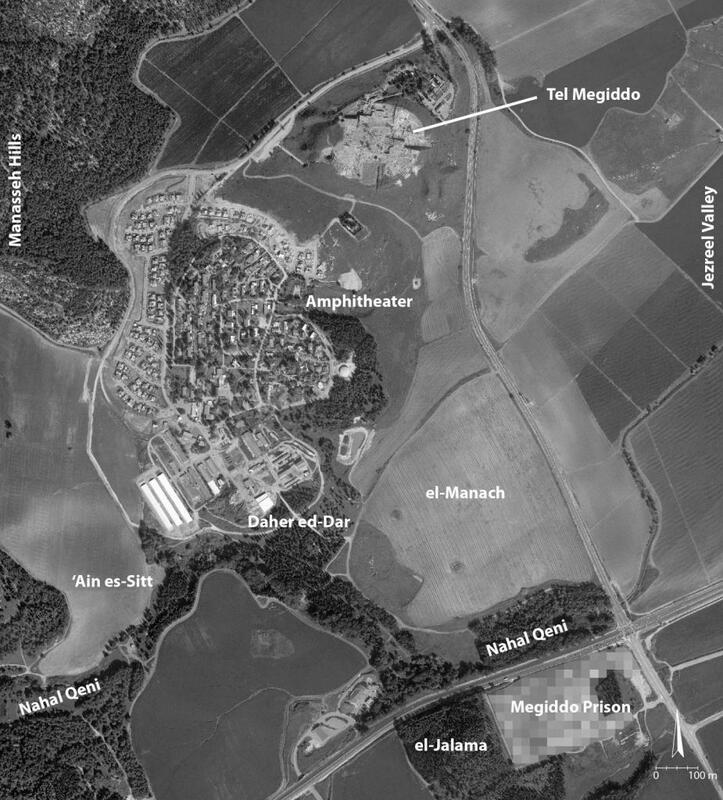 Speaking of revelations, the historical sites at Legio and Tel Megiddo are identified with Biblical Har Megiddo, the gathering place for the armies before the Last Battle in the New Testament (Revelations 16:16), the origin of the modern term Armageddon. 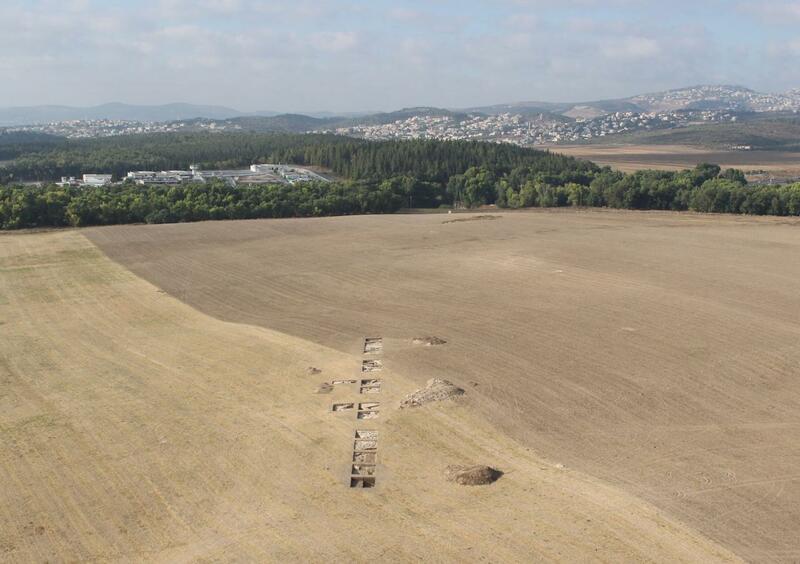 The Jezreel Valley Regional Project is only in its opening stages, but excavations at this theological and historical military gathering point have already yielded dramatic discoveries. 4 Jessie Pincus, Tim DeSmet, Yotam Tepper and Matthew J. Adams, “Ground Penetrating Radar and Electromagnetic Archaeogeophysical Investigations at the Roman Legionary Camp at Legio, Israel”Archaeological Prospection (2013) 1-13.